The term “olive leaves” refers to a mixture of leaves and branches from both the pruning of olive trees and the harvesting and cleaning of olives1. The production of olive leaves from pruning is ~25 kg per olive tree, and 5% of the weight of harvested olives collected at the oil mill can be added to that weight2. Olive tree (Olea europaea L.) leaves have been widely used in traditional remedies in European and Mediterranean countries3. They have been used in the human diet as extracts, herbal teas, and powder and contain several potentially bioactive compounds with a range of health benefits1. Where Does Olive Leaf Come From? The olive is an important crop in the Mediterranean Basin, which produces 98% of the world total (approximately 11 million tons)4, and lends important economic and dietetic benefits to the people of that region5. The introduction of olive cultivation coincided with the expansion of the Mediterranean civilizations, and the olive has been used widely in traditional remedies in European Mediterranean islands and countries such as Spain, Italy, France, Greece, Israel, Morocco, Tunisia, and Turkey. Olive leaf contains several potentially bioactive compounds that may have various beneficial health properties. However, two of the main components of olive leaves thought to be responsible for much of its beneficial effects are oleuropein and oleacein. Studies have shown these components to exert a range of antioxidant, antihypertensive, antiatherogenic, anti-inflammatory, hypoglycemic, and hypocholesterolemic properties1. In an example of olive leafs hypoglycaemic properties, in a recent randomized clinical trial, the subjects treated with olive leaf extract exhibited significantly lower HbA1c and fasting plasma insulin levels. The authors concluded that olive leaf extract may represent an effective adjunct therapy that normalizes glucose homeostasis in individuals with diabetes3. To add to this, olive leaf extract has been shown to attenuate pain associated with diabetic neuropathy6. In an example of olive leaf extract’s antihypertensive properties, it was shown to be similarly effective in lowering systolic and diastolic blood pressures in subjects with stage-1 hypertension as Captopril -a conventional hypertension treatment14. Further to this, in a study of 40 borderline hypertensive monozygotic twins, the twin receiving the higher dose of olive leaf extract (i.e. 1000mg vs 500mg) showed a significant decrease in mean blood pressure and cholesterol after 8 weeks15. Lastly, an earlier study in France found that administration of olive leaf extract to 30 patients with essential hypertension for 3 months resulted in a significant drop in blood pressure17. A series of studies have also provided good evidence that supplementation with olive leaf extract can help reduce skin damage and risk of melanoma associated with ultraviolet B exposure7-10. Other studies have suggested olive leaf extract has analgesic properties and may be useful in the treatment and/or management of painful conditions11. Yet other studies have suggested olive leaf extract may be effective for enhancing the healing of cartilaginous injuries and slowing/reducing the pathogenesis of degenerative joint diseases in humans12. In an example of olive leaf extracts anti-inflammatory properties, a study in rats suggests olive leaf extract may reverse the chronic inflammation and oxidative stress that induces the cardiovascular, hepatic, and metabolic symptoms in a rat model of diet-induced obesity and diabetes13. There is very little evidence in the scientific literature of negative or toxic side effects from oral supplementation with olive leaf extract. Most human studies using olive leaf extract have used dosages between 500mg and 1000mg per day14, 15. Many olive leaf extracts are standardised to contain minimum levels of oleuropein, which is considered to be the major active constituent in olive leaf extract. Therefore when comparing olive leaf extract supplements it is important to compare the respective levels of oleuropein. 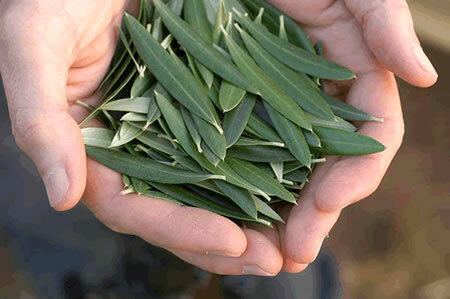 Olive leaf is most commonly sold as olive leaf extract in either liquid or powdered form. The liquid form carries a distinctive strong taste, which may be offensive to individuals with fussy taste preferences, such as children. Olive leaf extract is most commonly consumed as a stand-alone supplement, and as such recommendations for stacking are uncommon. Based on the wide range of available studies of olive leaf extract and a history of exposure and use of components of the extract through table olives, olive products and olive oil, the consumption of olive leaf is considered safe at levels up to 20 mg/kg/day16. 1. El SN, Karakaya S. Olive tree (Olea europaea) leaves: potential beneficial effects on human health. Nutr Rev. 2009;67(11):632-638. 2.Molina-Alcaide E, Yanez-Ruiz DR. Potential use of olive by-products in ruminant feeding: a review. Anim Feed Sci Technol. 2008;147:247–264. 3.Wainstein J, et al. Olive leaf extract as a hypoglycaemic agent in both human diabetic subjects and rats. J Med Food. 2012;15(7):1-6. 4.UN Food and Agriculture Organization. FAO Yearbook Production. Rome. 1995;48:118–119. 5. Japon-Lujan R, Luque-Rodriguez JM, Luque de Castro MD. Dynamic ultrasound-assisted extraction of oleuropein and related polyphenols from olive leaves. J Chromatogr A. 2006;1108:76–82. 6. Kaeidi A, et al. Olive (Olea europaea L.) leaf extract attenuates early diabetic neuropathic pain through prevention of high glucose-induced apoptosis: In vitro and in vivo studies. Journal of Ethnopharmacology. 2011; 136:188–196. 7. Mijatovic SA, et al. Multiple antimelanoma potential of dry olive leaf extract. International Journal of Cancer. 2011;128(8):1955-1965. 8. Sumiyoshi M, Kimura Y. Effects of olive leaf extract and its main component oleuroepin on acute ultraviolet B irradiation-induced skin changes in C57BL/6J mice. Phytother Res. 2010;24(7):995-1003. 9. Kimura Y, Sumiyoshi M. Olive leaf extract and its main component oleuropein prevent chronic ultraviolet B radiation-induced skin damage and carcinogenesis in hairless mice. J Nutr. 2009;139(11):2079-86. 10. Perugini P, et al. Efficacy of oleuropein against UVB irradiation: preliminary evaluation. Int J Cosmet Sci. 2008;30(2):113-20. 11. Esmaeili-Mahani S, et al. Olive (Olea europaea L.) leaf extract elicits antinociceptive activity, potentiates morphine analgesia and suppresses morphine hyperalgesia in rats. J Ethnopharmacol. 2010;132(1):200-205. 12. Gong D, et al. Olive leaf extract facilitates healing of experimental cartilaginous injuries in rabbits. Journal of Medicinal Food. 2011;14(3):268-275. 13. Poudyal H, Campbell F, Brown L. Olive leaf extract attenuates cardiac, hepatic, and metabolic changes in high carbohydrate-, high fat-fed rats. Journal of Nutrition. 2010;140(5):946-53. 14. Susalit E, et al. Olive (Olea europaea) leaf extract effective in patients with stage-1 hypertension: comparison with Captopril. Phytomedicine. 2011;18(4):251-258. 15. Perrinjaquet-Moccetti T, et al. Food supplementation with an olive (Olea europaea L.) leaf extract reduces blood pressure in borderline hypertensive monozygotic twins. Phytother Res. 2008;22(9):1239-1242. 16. Soni MG, et al. Safety assessment of aqueous olive pulp extract as an antioxidant or antimicrobial agent in foods. Food Chem Toxicol. 2006;44(7):903-15. 17. Cherif S, et al. A clinical trial of a titrated Olea extract in the treatment of essential arterial hypertension. J Pharm Belg. 1996;51(2):69-71.